What typically comes to your mind when a client presents with chronic sciatic symptoms — disc herniation, facet joint osteoarthritis, sacroiliac fixation, piriformis syndrome? It’s true that any one of these issues may cause nerve compression leading to radicular hip and leg pain. However, in this article we’ll investigate an underappreciated sciatic nerve antagonist: the iliolumbar ligaments (Image 1). 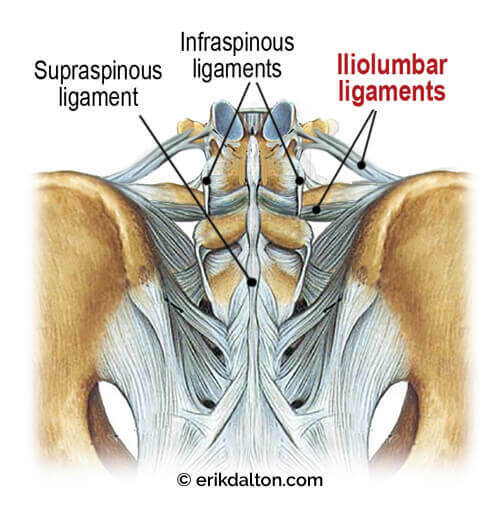 Image 1: Iliolumbar ligaments here attach the ilia to L4 and L5 and blend with the supraspinous and interspinous ligaments. As these ligaments weaken from such trauma, they lose the ability to prevent the fifth lumbar vertebra from shifting forward on the sacrum. The subsequent forward shifting creates narrowing of the intervertebral foramen and, eventually, degenerative entrapment of the sciatic nerve. Left untreated, the result is tearing of the outer layer of the disc, formation of fissures in the annulus, and possible triggering of sciatic nerve inflammation. Corrective exercises such as planks and bird-dogs may restore strength and stability to these stretch-weakened ligaments, and some believe that fast-paced, low-force “scrubbing” helps tighten ligaments through enhanced fibroblastic proliferation (Image 2). In extreme cases, slippage of the fourth or fifth lumbar vertebra may result in spondylolisthesis, where the pars interarticularis cracks from excessive pressure, allowing sciatic nerve entrapment on one or both sides (Image 3). Image 2: Extended index and middle fingers form a “flying V” tool for scrubbing the iliolumbar ligaments. The therapist assesses the ART (asymmetry, restriction of motion and tissue abnormality) with this fast paced scrubbing technique. Note: when clients present with excessive lumbar lordosis and bilateral hip and leg pain, refrain from placing them prone on the therapy table and applying downward pressure to the lumbar spine. You do not want to be responsible for additional vertebral fractures. If in doubt, always suggest an orthopedic assessment before continuing therapy of any kind. Put simply: do no harm! There are two ways iliolumbar ligaments may contribute to sciatic nerve compression: weakness on the posterior side, and anterior tightness. To begin, let’s review the pertinent anatomy and biomechanics leading to “iliolumbar ligament syndrome.” Then, we’ll review some myoskeletal techniques to relieve strain and sciatic compression. The primary role of the iliolumbar ligaments is to prevent excessive lumbar side-bending, but these ligaments can indirectly contribute to sciatic nerve entrapment when injured. 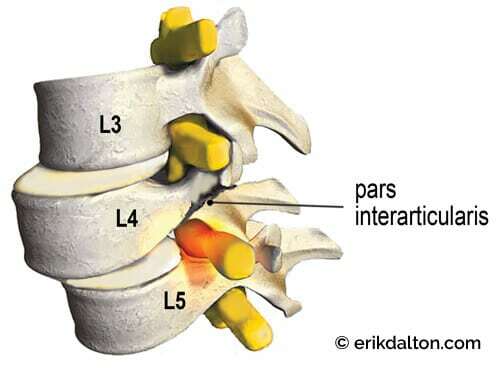 Notice in Image 1 how the iliolumbar ligaments blend with the interspinous and supraspinous ligaments to help prevent forward shifting of the fifth lumbar vertebra on the sacral base. This stabilizing force relieves pressure on the intervertebral disc and allows normal functioning of the facet joints. A traumatic event—for example, a forward-bending and twisting maneuver while attempting to lift a heavy object—may strain the iliolumbar ligaments and their multifidi neighbors. 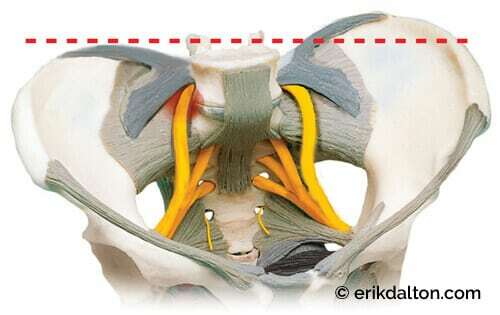 Image 4: Iliolumbar ligaments form fascial hoods that provide lumbosacral and sacroiliac joint stability. 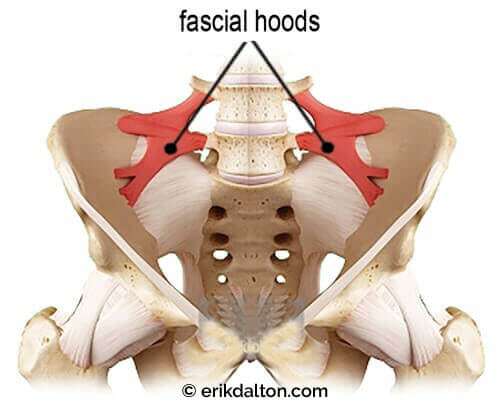 In Image 4, notice how the taut bands on the anterior surface form “fascial hoods” over the L4 and L5 nerve roots.1 Once the greater sciatic nerve (about the size of your pinky finger) leaves the spine, it must traverse through these taut bands. In a nicely aligned pelvis, this usually presents no compression problems. But visualize what happens to the sciatic nerve in Image 5 when the right ilium anteriorly and inferiorly rotates, causing the iliolumbar ligaments to tighten down on the underlying nerve roots. The brain may try to stabilize the lumbosacral joint by layering the area with protective multifidus muscle spasm, but it does little good to try to release hypertonic spasm in these spinal groove stabilizers until the pelvic alignment problem is corrected. Fortunately, there are many ways manual therapists can successfully assess and correct this alignment problem. The iliosacral alignment technique shown in Image 6 is one of my favorites. A stable pelvis, achieved through proper upper and lower quadrant balance, is essential for long-term correction of sciatic nerve conditions. All ligaments and muscles attaching to the pelvis from above and below should be addressed. Sciatic nerve pain is caused by a combination of pressure and inflammation, and treatment is centered on relieving both of these factors. Myoskeletal techniques for sciatica include low-force mobilization and graded-exposure stretching to help the brain recognize and reorganize neural input to the affected area. Image 5: A torsioned pelvic bowl causes the anterior iliolumbar ligaments to entrap a branch of the sciatic nerve. 1. P. Hanson and B. Sonesson, “The Anatomy of the Iliolumbar Ligament,” Archives of Physical Medicine & Rehabilitation 75, no. 11 (November 1994): 1,245–46. 2. A. R. Upton and A. J. McComas, “The Double Crush in Nerve Entrapment Syndromes,” Lancet 2, no. 7,825 (August 1973): 359–62. Erik Dalton is executive director of the Freedom from Pain Institute. Educated in massage, osteopathy, and Rolfing, Dalton has maintained a practice in Oklahoma City, Oklahoma, for more than three decades. For more information, visit www.erikdalton.com. What’s really triggering the muscle spasm?